May 12, 2017 Posted by: admin Category: Uncategorized Comments Off on Hello world! Moeller's reputation and ability to produce the highest quality stamping and die components is a reflection of our diversification and time-tested drive for excellence. Our commitment to quality and customer satisfaction extends beyond our facility to each of our customers. 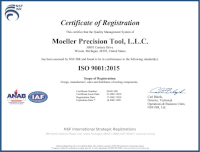 The goal of Moeller Precision Tool is to partner with our customers to ensure their needs and expectations are satisfied. Quality must be present in the product we provide as well as in our conduct and customer service levels. Our commitment to quality is obtained through employee involvement and continuous improvement. Moeller Precision Tool, LLC. © 2019.